You will remember that during my trip to Victoria I purchased a skein of Handmaiden Seasilk in a lovely, one-of-a-kind colorway. I had only 400m of yarn – enough to do only a small project. 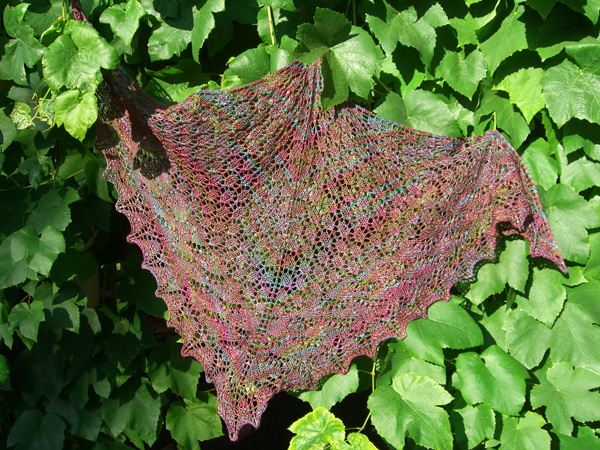 Interweave Knits serendipitously published the Swallowtail Shawl pattern at about the same time. I was afraid that the colors would get lost in the lace, but that didn’t happen. Instead the negative space around the solid portions served to enhance the color changes. And here we have the finished product, displayed against my grape arbor. Its insubstantiality is shown by the fact that it is being held up by grape leaves twisted together because I forgot to take a few pins out with me and didn’t want to go back in to get some. The yarn was a joy to knit. 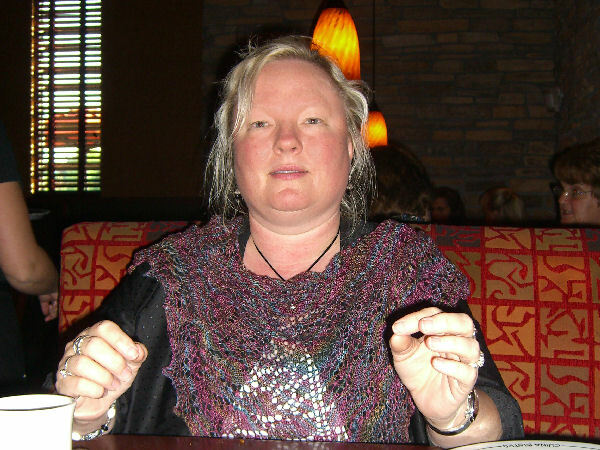 In fact, I knit obsessively on this project until it was finished, which took about 1 week. The whole time I was knitting it, I showed it to everyone who would stand still long enough to look (even non-knitters, bless them) and insisted that they feel the fiber and exclaim about the colors. Be forewarned, the yarn is addicting. I would have continued to knit obsessively on it had I not come to both the end of the pattern and almost the end of the yarn. I have only a small handful of yarn left. I love the pattern that the lace shadow makes against the leaves in the second picture. Swallowtail was made as a birthday present for the lovely LT. She was happier than she looks in this picture. Really. 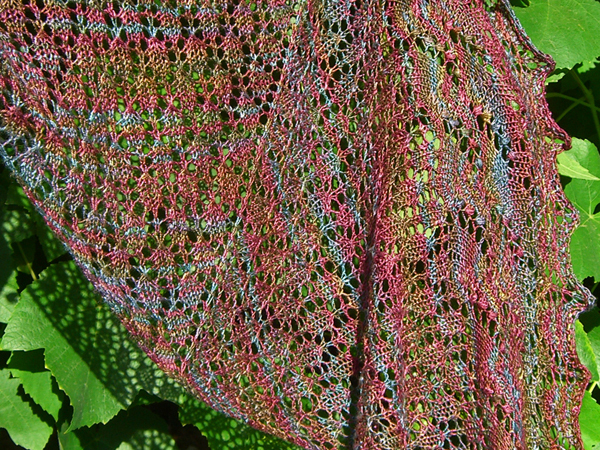 You can check out the blob-on-a-needle and blocking pictures over at the Swallowtail Project Page. Needles: Lantern Moon ebony, US#4 (3.50mm) – note: not recommended for lace knitting. The points are too blunt.